I guess I should get the (many) qualifiers out of the way first. I do not believe LeBron James to be an anti-Semite. I do not believe LeBron James harbors any hateful feelings towards Jews. I do not believe LeBron James should be fined, or suspended, or placed on any sort of double-secret probation. I’ll also add that I’m not some Pepe the Frog-like creature (hello, Clay Travis) who’s been waiting for a moment to pounce on the world’s most outspoken black athlete with a bag of what-about-isms. I’m a fan of LeBron’s, and applaud how he’s chosen to use his platform and voice to educate, enlighten and, often, rebuke. I typically find his social commentary intelligent and strikingly cutting. All of which is precisely why I was so disappointed by his Instagram post yesterday, and angered by his faux-apology afterwards. I don’t think a genuine apology has ever contained the words “if I offended anyone.” That’s the kind of thing a public person says when they feel they have to apologize for PR reasons, not because they erred. It’s also the kind of phrase that reveals a person’s ignorance, which, in this case, is what LeBron has shown himself to be. I truly do believe LeBron believes he’s being complimentary when he says Jews are good with money. But ignorance is no excuse for dangerous speech from a public figure and it certainly doesn’t give said public figure, no matter how much we like him*, the freedom to issue a half-assed, hollow apology where he claims to have not known better and then double down on the offensive speech. LeBron didn’t accept ignorance as an explanation when Phil Jackson described him and his friends as a “posse.” I’m not sure why he thinks I and other Jews should accept that as an excuse here. *So much our social and political conversations these days are about knowing who’s side you’re on first and then carving out opinions that fit under those umbrellas. For the most part, the people who cover sports are on the same “side” as LeBron’s (i.e, not Donald Trump’s). We’ve all spent so much energy applauding him for taking on Trump and others (Long Live U Bum!) that, I think, many in the public and the media are hesitant to go after LeBron on this. ** I’m also confused as to why this whole ordeal hasn’t generated the sort of rage that we often see when a public figure says something offensive. Like, why hasn’t Dave Zirin written or Tweeted a word about this? Is this an access thing (in that reporters are afraid to lose access to LeBron?) Is it a Jewish thing? If the answer is because we’re all finally learning that it’s OK to not always pounce on people for mistakes then I’m cool with that. But I don’t suspect that’s the case here. Here’s the history and context that LeBron (and, given my Twitter mentions and some quick scans of social media, many others) are clearly unaware of. By linking Jews to money, LeBron was perpetuating a stereotype that has literally caused the murder of millions of Jews. This is not the space for a full lesson on the history of anti-Semitism, so let’s just summarize it by saying that the belief that Jews controlled the world’s money was, and is, often at the root of that hate. Put another way: Six millions Jews weren’t murdered during the Holocaust solely because Hitler and his acolytes disliked Jews; they were targeted because Hitler and his followers believed Jews to be dangerous and in need of extermination, and the view that Jews are greedy and conniving and able to control banks and financial institutions was a major reason why. That form of Anti-Semitism hasn’t dissipated in the years since. The Holocaust might be in the past, but the root of what led to it still lives. Have you heard the way the alt-right described George Soros? Or the chanting in Charlottesville? Or seen some of Donald Trump’s favorite memes? I don’t expect LeBron James to know all this. Why would he be well versed in the history of Anti-Semitism? * Again, this all started with a rap lyric and not an original quote, and it’s not like 21 Savage is the only rapper to recently make a reference to Jews and money. Jay-Z did the same thing on his most recent album. *To that point, we could go much deeper on the relationship and history between African Americans and Jews and how each perceives the other, but that’s a much larger conversation—one covered a bit by the great Adam Serwer last year—for a different time, and a macro conversation. I’m trying to keep this in the micro. So I understand how LeBron—who understands that everything he does and says is considered “news”—could post that lyric and not have any idea that doing so would be feeding into a dangerous anti-Semitic trope. That’s fine, and what education is for—if you’re willing to be educated. LeBron, however, seems unwilling to acknowledge that he’s in need of one. This would be problematic for most public figures. Take someone like LeBron and it becomes even more troublesome. LeBron, after all, has spent the past few years constructing a platform for himself that is unlike anything we’ve ever seen in the world of sports. He’s spoken out an all sorts manners of non-sports matters, and even hosts a talk show on HBO where social commentary is the primary focus. He’s made it clear that he wants to be considered an authority on social issues, and I believe he deserves to be commended for this. But you can’t pick and choose when your words matter and when they don’t. LeBron has grown to the point where he now carries a voice that has the ability to shape minds throughout the world. He possesses a power that few do. But that power comes with a responsibility. I don’t think I’m asking too much when I say that this responsibility includes not promoting, and then defending, the use of thousand-year-old Anti-Semitic tropes. I put these down in my newsletter earlier this week (yes, I have a not-close-to-weekly newsletter that you should all subscribe to), but figured I’d put them down here too. You know, this way in a few months we can check back and see how dumb I am. First off, welcome to the world. Right now I’m sitting at the kitchen table in Bubby Marla’s (is Bubby what we decided, Marla?) and Grandpa’s house, and you’re in the family room, on uncle Corey’s lap wrapped in your pink swaddle and so small and cute and beautiful, and you’ve only been in this world for three days, and yet somehow I already can’t imagine my life without you—though as I read this over I hear you wailing away upstairs and, well, let’s just say this parenting thing is really weird. Anyway, please forgive the hackiness of this post—I mean formatting it as a letter? Such a cliché. It’s just that I really wanted to explain why your mother and I decided to name you Maayan Shalva. Also, I thought one day you might like to know how it is that you came to hold such a seemingly strange and non-American sounding name. After all, the name Maayan Shalva didn’t just appear out of thin air. Mommy and I gave it tons of thought, and even threw a few jabs at one another. So let’s start with your middle name, Shalva. Shalva is a Hebrew word, it means tranquil, or peaceful. It can be found in verses in Job, Proverbs and other Judaic texts. It’s the feminine conjugation of the word Shlomo, which in English is Solomon. Your great grandfather’s name was Solomon (Solomon D. Rosen, to be precise). He was my mother’s (I’d use her grandmother name here but she’s having some trouble picking one) father, my Popi. He died this past January, just about six months before you were born. I know that as I write this you’re barely a person, but I have no qualms saying that you would have loved him. How could you not? He was everything you look for in a role model: smart and challenging but also kind. Proud but also selfless. Others came first. He always had a smile on his face, even as his body continued to fail him over the years in cruel ways. He never stopped learning, never stopped being curious about the world around him. He loved his family, his religion, his people, his countries (America and Israel), and a good corned beef sandwich. Also, he was a huge NBA fan. Need I say more? We’re naming you after Popi so that we can honor him and keep his memory alive. But also, our hope is that giving you his name, Shalva, inspires you to follow in his footsteps and live a life that he would have made this great man proud. As for Maayan, well, let’s begin where Mommy and I did—with the letter “M.” That’s for your Mommy’s Zayde, Bubby Marla’s father, Max. Like you, I never had the pleasure of meeting Zayde. But over the years I’ve heard so many stories about him and learned so much about his life. He was the epitome of a special man. Once, while in the camps, Nazi guards discovered a pair of hidden tefilin and phylacteries. They began threatening prisoners as they tried to learn to whom they belonged. Zayde, knowing the owner of the tefilin was too weak to withstand the punishment that would no doubt come his way if it were learned that he was the owner, claimed them as his own. He was beaten, but survived. And he never regretted the decision. 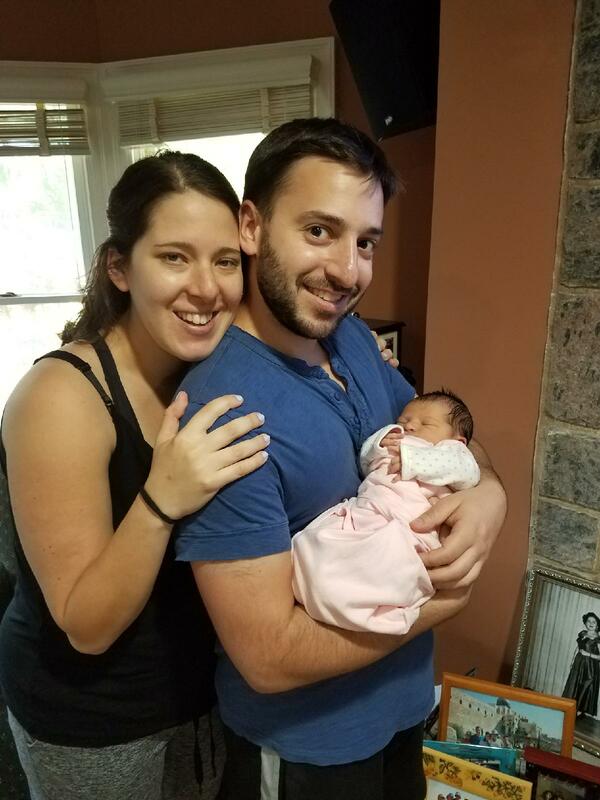 Despite all this, Zayde insisted on building a Jewish home in New Jersey. Which is great, but the trait that those who knew him use most when describing Zayde, and which I hope you imbibe, was his kindness. By all accounts, Zayde was as kind a man as there is. Need proof? Just ask Mommy’s Savta. Edith Horowitz is not a person who suffers fools. She’s not a woman who doles out compliments just to be nice. But ask her about your Zayde—a man she was not related to and didn’t have to love—and she’ll tell you what a special and sweet person he was. Our hope is that you live up to his name. Now let’s talk about your full name. Maayan is Hebrew for wellspring, meaning a light in darkness. For one, Zayde’s Hebrew name was Meir, which means one who shines. The idea behind the names are the same—a Maayan brings comfort and warmth to those in need. It was also important to your mother and I that your name be Hebrew. We wanted you to always be aware of your heritage, religion and culture, and to always feel connected to your second home—Israel, and to be proud of all of it and not slink into the background. Will it sound strange to some in America? Perhaps. But my hope is that one day you grow up and realize, like I, as someone named Yaron did, that being able to correct people (it’s Ya-rohn, no Yah-rin) is actually a blessing, to be able to explain to people what language your name is, and what it’s like to be Jewish and connected to Israel—that’s a great honor and gift, and also a responsibility we want you to have. So, Maayan Shalva, that is how you got your name. Your name is there to honor Zayde and Popi, but also to serve as a beacon for the life we hope you live. Our blessing to you is that you live a life that would have made both them proud, and that you serve as a wellspring, a light, a comfort, to your friends, family, people and countries. Who Wants to Read a Lot of Words About the NBA? Time for my sort-of-bi-weekly update on things I’ve written and podcasts/video hits I’ve done recently. I got to go to the NBA Draft lottery, which was interesting and fun but also weird and a bit boring. Anyway, here’s my write-up from the night, on the now all-powerful Boston Celtics, with quotes from the team’s co-owner, who was downing pizza while speaking to me. Apparently billionaires get hungry too. Have you guys heard about this LeBron James guy? He’s pretty good. If I may toot my own horn for a minute, though (isn’t that the point of this website?) I was actually proud with how I handled this game story. Instead of waiting by the podium for the players to come out, I sort of posted up in the Cavs locker room and wound up getting some good scenery of LeBron reveling in his performance. So I guess what I’m trying to say is: I’m awesome. I spoke to Cavalier newcomers Kyle Korver and Deron Williams about the notion of magical switches. They both had interesting things to say. Oh, hey, more drama with the Knicks. I had the great Katie Baker on the Krispod Porzingcast to talk about the ’90s Knicks, which was fun because Katie’s great but also because it’s nice to take a break from talking triangle and other shapes. Here’s my spitting hot fire about the NBA on CNN Philippines. And here, apparently, is my new stalker. Spent a decent amount of time helping the awesome Brandon Sneed report this awesomely weird story about the need for NBA coaches to wear suits. Check it out. I’ve written four stories from Boston over these playoffs. A game story/featurette following Thomas’ epic 53-point Game 2 performance against the Wizards. Hey, have you noticed there are a TON of former Knicks in the playoffs? I also recorded a podcast with ESPN’s Ian Begley breaking down the Knicks’ offseason. I joined the always fun SLAM Magazine podcast two weeks ago as well. Good friend Josh pointed out that, being that I’m so prolific, it would be smart for me to compile a newsletter of some sort linking to all the stories I’ve written the previous week. I’m not sure I want to invade the sacred space of an e-mail inbox, but figured why not do a weekly post containing all my links and the like (because who wouldn’t want to read everything I write, right?